With the League Championship Series (Yanks v. Angels & Dodgers v. Phillies) upon us, some questions have fallen into my lap. With 3 of the 4 teams eliminated by brooms in the first round of the MLB playoffs, hopefully things are about to get a tad more interesting . . . Question 1: Which remaining team has the starting pitching advantage? Question 2: Is there any validity to the 'team of destiny' label on the Los Angeles Angels of Anaheim? How can I, a devoted Red Sox fan, not believe in teams of destiny? 2004 anyone? Yes! Yes! Yes! I believe in teams of destiny, and the Angels are one of those teams. They are getting brilliant starting pitching, they are getting timely hitting, and best of all, they just beat the Sox in Fenway, in the ninth! Need anymore proof? The unfortunate death of rookie pitcher Nick Adenhart could have derailed the Angels and 2009, it's doing the opposite! The fans, the franchise, the players, everyone is in it with a huge amount of heart. This is the story that is meant for the silver screen, the way these guys are playing and what they are playing for, it's mythical. The most impressive thing they've done thus far, prove they can play with the American Leagues top teams. Beating the Red Sox as they did is impressive and should send shock waves all the way to the Bronx. Their bullpen didn't look bad, the players were moving on the basepaths as they always do, and all that included, they are playing for something bigger. If the Angels aren't a 'team of destiny', I don't know who is. Question 3: Will last years World Series MVP, Cole Hamels, return to his 2008 playoff form? If your a Phillies fan, which I'm not, then you have to hope so. The Philadelphia lefty had one of the best postseasons of any pitcher over the past fifteen years in 2008. Over (5) starts, Hamels dominated hitters with a mind boggling 1.80 era and helped bring a World Series Championship back to The City of Brotherly Love. However, in his last start of the regular season and first start of the postseason, he's looked very average. Two starts, two Phillies losses, only eight innings pitched, and seven earned runs allowed. What do I think? I think Cole Hamels is made of the same fabric as Josh Beckett, when it's on the line you can give him the ball. Hamels laid down a history book performance in 2008, there is no reason to think he'll drop off the map in this years playoffs. 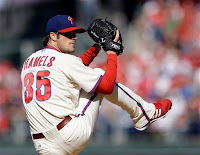 One more bite for you, in his two starts against the Dodgers this season, Hamels has been flat out dominate to the tune of a 0.56 era over 16 innings pitched and only a single earned run allowed. With that being said, the Phillies acquired Cliff Lee, last years A.L. Cy Young, as insurance. Lee & Hamels are a dangerous pair if they are both on. Question 4: Dodgers in Chavez Ravine or Yanks in The Bronx, who has the greater home field advantage? Both teams with homefield advantage in the league championship series pose very, very different atmospheres. As cold weather moves its way into the northeast, southern California is still shining bright. Both teams, the Yankees & Dodgers, dominated opponents at their home digs. In their first year in Yankee Stadium II, the 'Bronx Bombers' posted the most home wins (57) among major league ballclubs. As for Joe Torre's Dodgers, they gave Dodger fans (50) home wins, good for second most in the National League. I could stretch this out a little longer and tell you playing in warm weather is a huge advantage for the Dodgers, and by the time they get to Philly, it'll be icy. However, none of that compares to the advantage the Yanks have acquired. In more than 130 less at bats in The Bronx, the Yankees offense hit 28 more homers. Eight hitters had more than 15 homers on the season, attest that to the home field advantage they have. 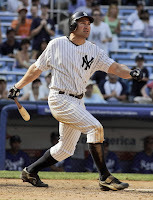 The best example would be that of 35-year old outfielder, Johnny Damon. 17 homers within his own confines, and only 7 outside. While Chavez Ravine has a better crowd who demands less, warmer weather, and in Southern California, no advantage is like that of the Yanks. Question 5: Which one player will have the single biggest impact on his team? No hesitation. Angels center fielder, Torii Hunter. It would be all to easy to pick the most dominant pitcher remaining, maybe even look for a lock down closer like Mariano. However, I firmly believe Torii Hunter is the one thing recent Angel teams have been missing. Humour me for a moment, please. Hunter is in the midst of a career year. In 100 less at bats than a year ago, Hunter has driven in 12 more runs. More so, he's the heart and soul of this Angel team. The moment for me? When Hunter slammed his game 1 homer off Jon Lester to send a message to the American League, these aren't the same Angels. Hunter gives the Angels more energy, an edge, and a whole lot of heart they've been missing. A near .300 hitter in the regular season, 20+ dingers, and 90 RBI, Hunter is the tough veteran they've been missing. Stick him in a lineup that includes veterans Vladimir Guerrero, Bobby Abreau, and of course the 26-year old sensation that is Kendry Morales (34 HR's, 108 RBI, and a .306 BA) these Angels are as good as they've ever been. Torii Hunter brings this team exactly what Nick Swisher brings the Yankees, but he does it with far more production, that's why Torii Hunter is the single biggest impact player remaining in the postseason. Catch me on TWITTER! Catch us on the PODCAST! Thanks for reading!